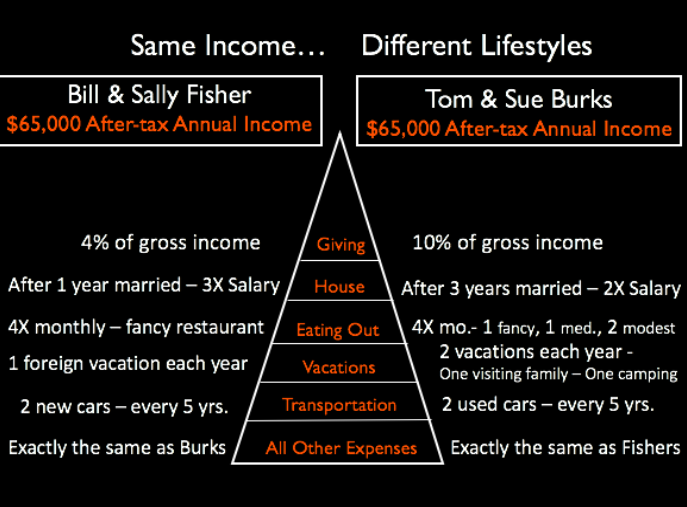 How do you match your lifestyle for your income? You can only afford a lifestyle that fits into your income. Many people actually create a lifestyle beyond their income, and use debt to fund that lifestyle, but then it’s not sustainable and they end up going through extreme emotional hardship fighting that debt and lowering their lifestyle. The hard part is that it often requires three times as much effort to fight your way out of debt, than to live within your income in the first place. How Much Do They Have to Cut Lifestyle? They were spending $51,000 per year and now must spend $48,000 per year for 10 years to get out of debt. Ten Years Later … Fishers saved $0 while the Burks saved $117,000.